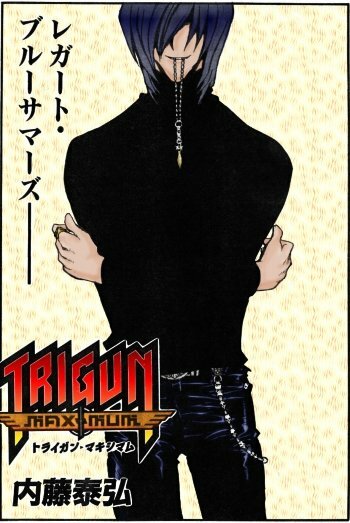 Welcome to my Trigun Maximum Scan page (updated 04/24/11)! Every single thing on this page is a scan, artwork copyright by Yasuhiro Nightow (used without permission - so I'll take them off if he asks, but woah, I'd be flattered that he finds this site!). 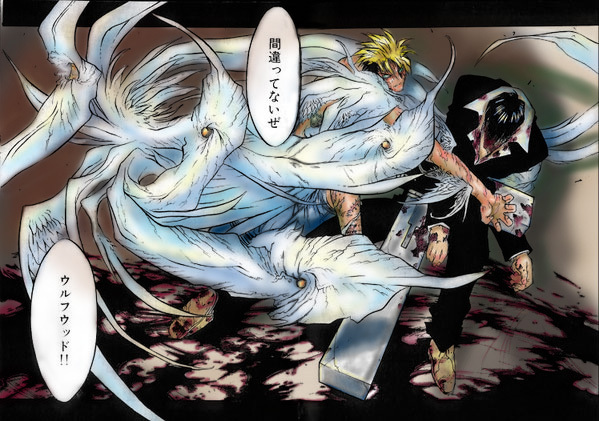 Most of the scans however have been colored by yours truly because, well, they just look SO cool in color! Too bad most manga is in black and white! So enjoy the desktops and black & whites, but please don't use the colored ones without permission! 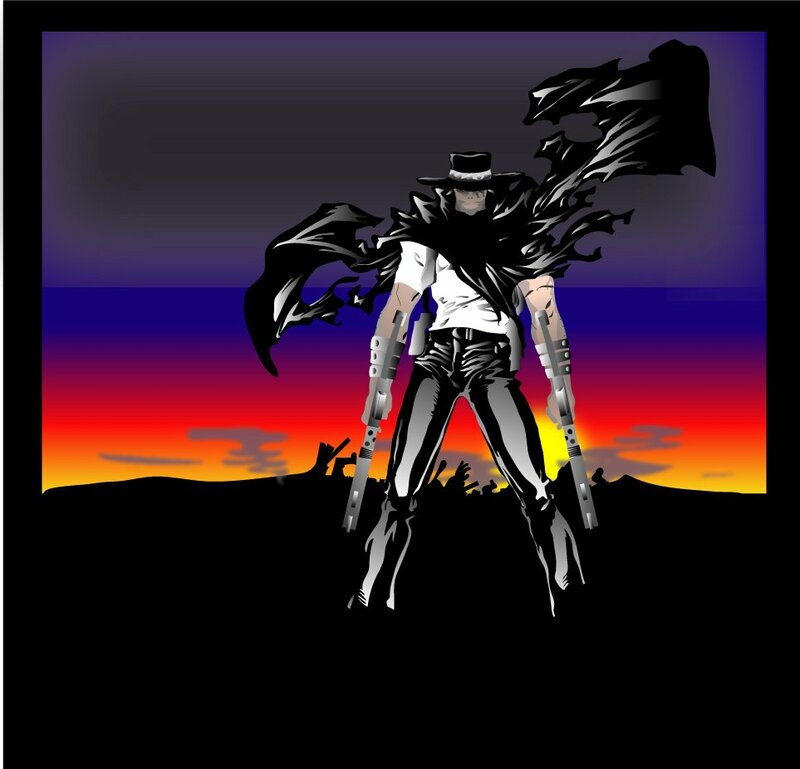 This desktop was the first I made, the image comes from TM#7. I scanned it, cleaned it up, then later painted it by hand and then did the finishing touches on the computer. Puchiko is always doing me these great gifts!! The first one was Livio, a request of mine since I love Livio! And the second is Vash and Meryl - since we love them so much, it's so adorable! And I love the pink. ^_^ Thank you Puchiko! New Artist - whoot!! Jillian just started emailing me recently and sent me the first one originally uncolored (and beautifully joined btw) but then once I found out she's a talented PhotoShopper I said, how about coloring it? So these are the first ones so far! Really terrific! Thank you Zach! 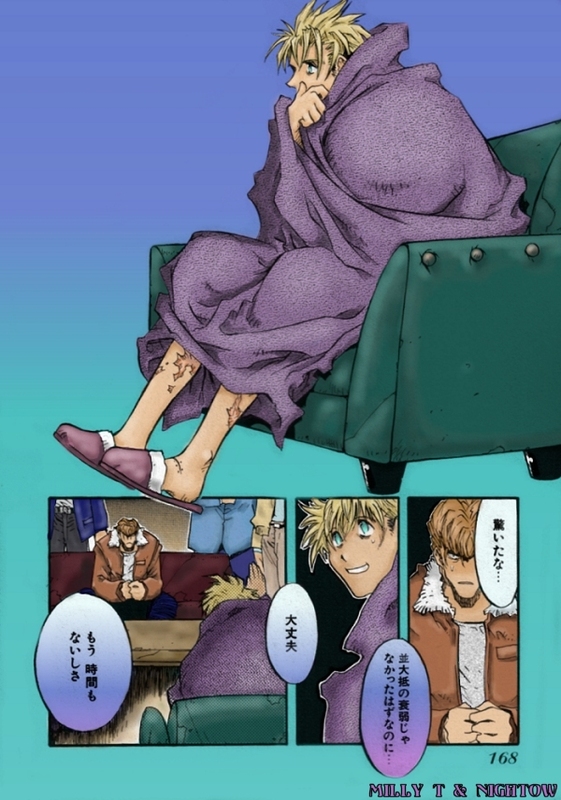 Talking online to Zach awhile ago I asked if he wouldn't do a colored manga scan for me and sure enough, he sent me this last night! SWEET!! 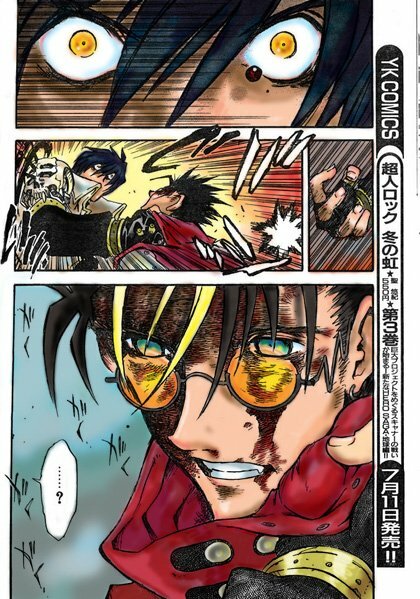 This one is from the beginning of the final fight with Vash and Knives, Vash just manages to avoid one of Knives' attacks in this scene - it's a really awesome two-pager, but Zach cropped it for this coloration. Danke danke!! 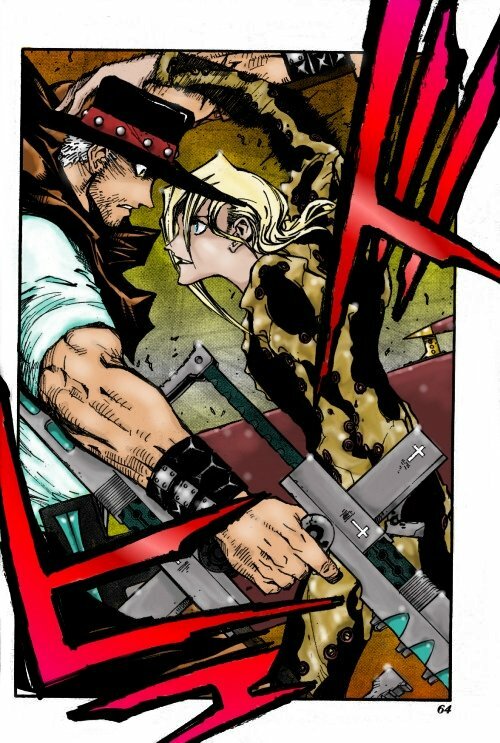 This little pic is kinda a coloration, and yet not - I thought this was a really good place to put it seeing as though it's based upon a scene of Livio about to face the army on Gunsmoke after they'd tried to shoot down Vash and Knives. Thanks for letting me use this one Jenette! ^_^ I LUVS Livio! This little beauty (or should I say BIG?) 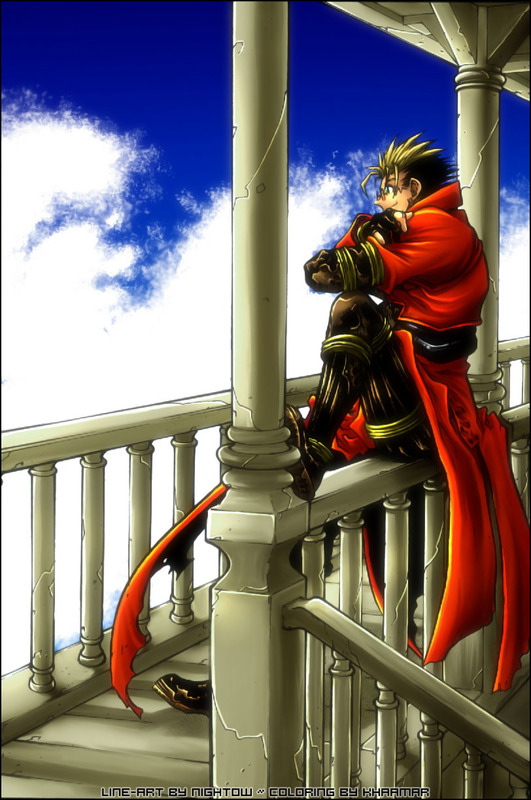 was posted on DeviantART a few weeks ago thanks to the release of Trigun Maximum #14. I begged to be able to post it here since I hadn't been able to collect any good CGI in...like a year..! Thanks for the great job AngelArms!!! 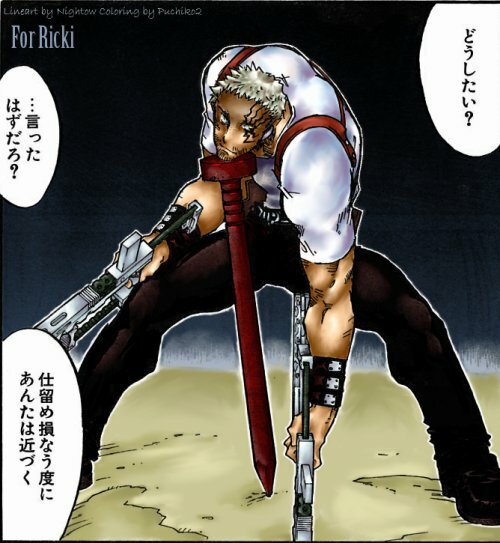 Trigun Maximum #5. 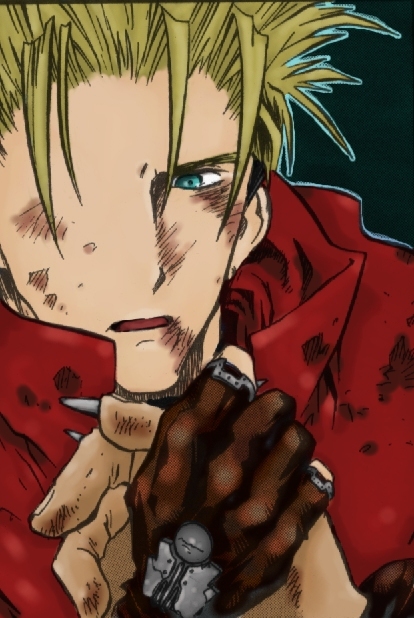 Vash holding Hopperd's hand as he dies. Susan-chan requested this one from me, just a real nice sweet scene. 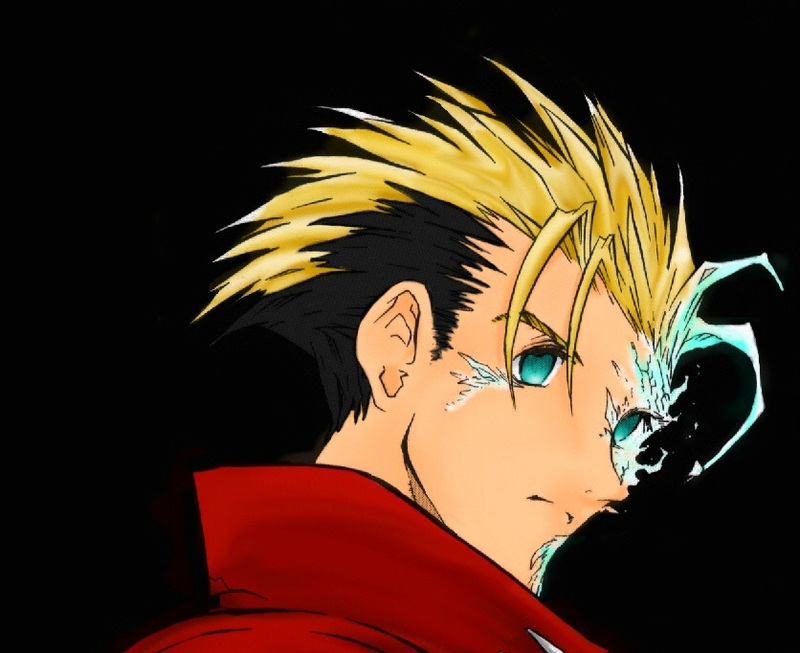 I enjoyed doing this one because of the blood on Vash, I'd never attempted something so subtle before, it's a nice change of pace and it came out really stunning for a few hour's work. (11/8/05) Livio VS Elendira!! 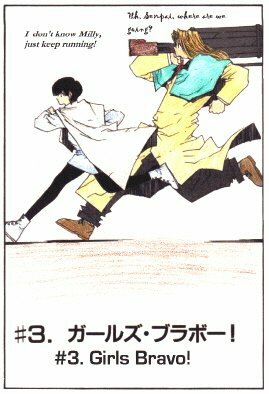 From Trigun Maximum #13 (YKO #88). Took me FOREVER to color this one even though I was working with it in a very small size (what you see when you click on it was the size I worked on it) - but because of my schedule I could only do a tiny bit at a time. The background didn't come out quite like I wanted it, but it highlighted what I wanted it to. ^_^ And coloring sound FX was quite fun! 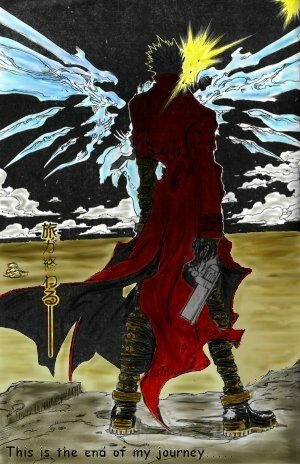 Trigun Maximum #13 (YKO ch. 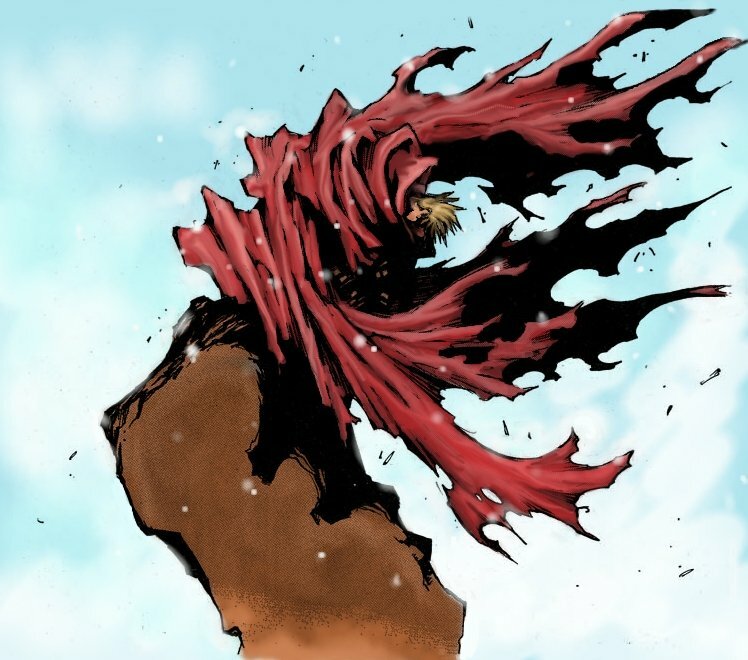 92) Okay - now, before you think "his cape should be brown", I wanted to do it red because it's so much more stunning against the blue background. 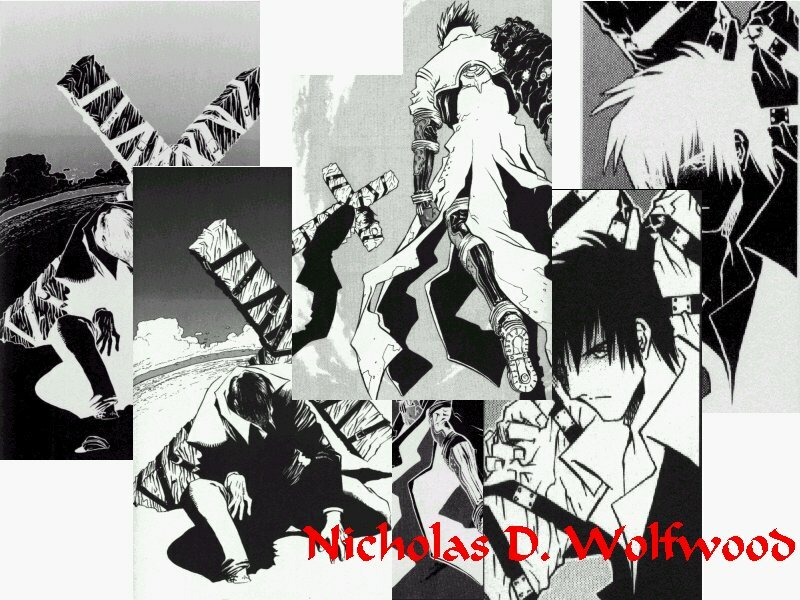 ^_^ This Vash actually comes from one of Legato's flashbacks after he's seen Knives dead after the Lost July. I had the black and white version on my desktop for awhile and it kept showing up red for me in my mind. It took me awhile to do this one since I removed much of the tone and had to redraw some of the lines later on. I used a Wacom pad with this one, but I'm still learning how to use it so it didn't come out quite as sharp as others have in the past. 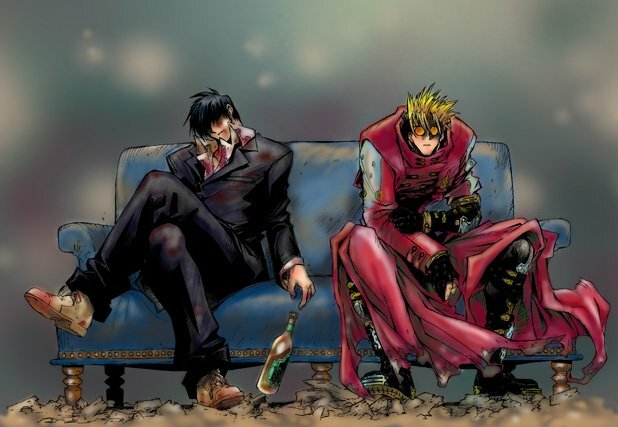 Trigun Maximum #12 (YKO ch. 83) Livio!! Yay!! I seem to be doing a lot of him lately... but he's just so cool. I keep changing the color scheme on him too. Ah well, more fun that way. This one was suggested to me by Darius, I wanted to send it to him before putting this up, but I haven't seen him online in a while, hopefully he'll see it here if I miss him! I do like to take requests but it does take me time to work on CGI art because as you can see with this one, there's a lot of work put into the coloring! Trigun Maximum (#3) this one I watercolored. 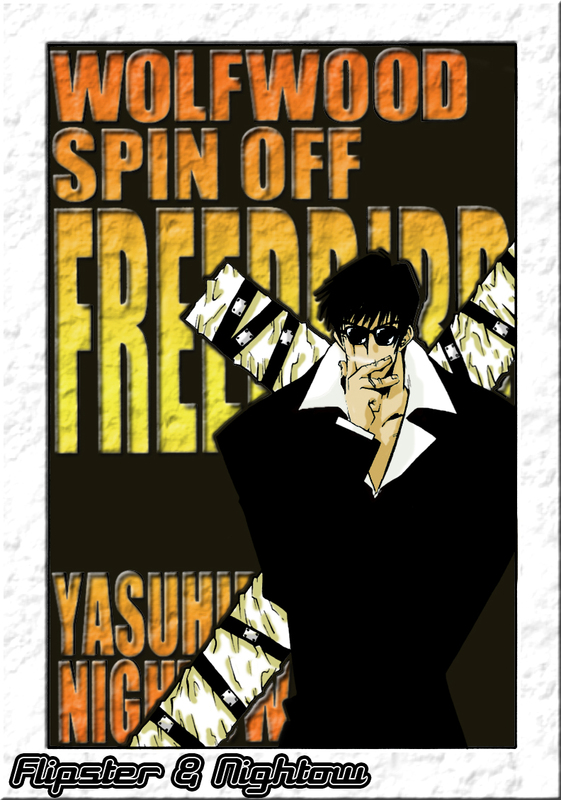 Trigun Maximum #7 scan and originally painted with acrylic... However, seeing as though the original B&W scan was still on my computer (in the hopes of one day doing a CGI) it is now replaced with the new version! Oh I love this picture even more, I'm so glad that after 3 years (yes three!) I've learned how to do colorations like this. This one is my ultimate favorite - I have a copy in my car... some people have cd holders on their visors, I have Vash!!! 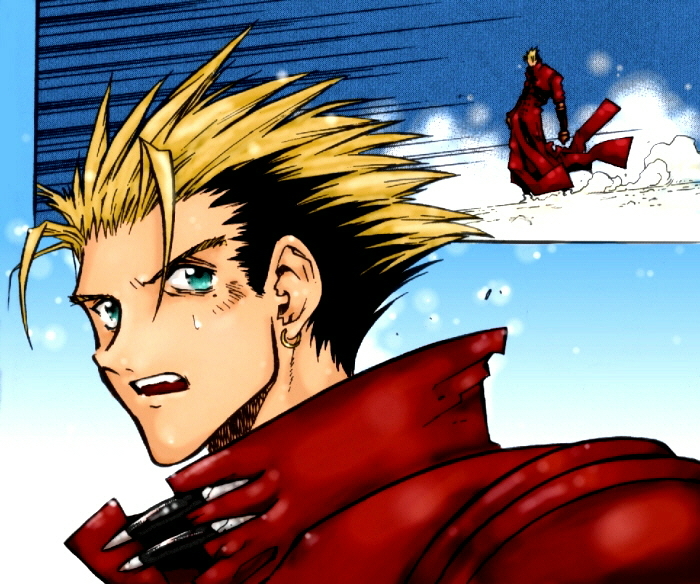 Trigun Maximum #3. I love this one. 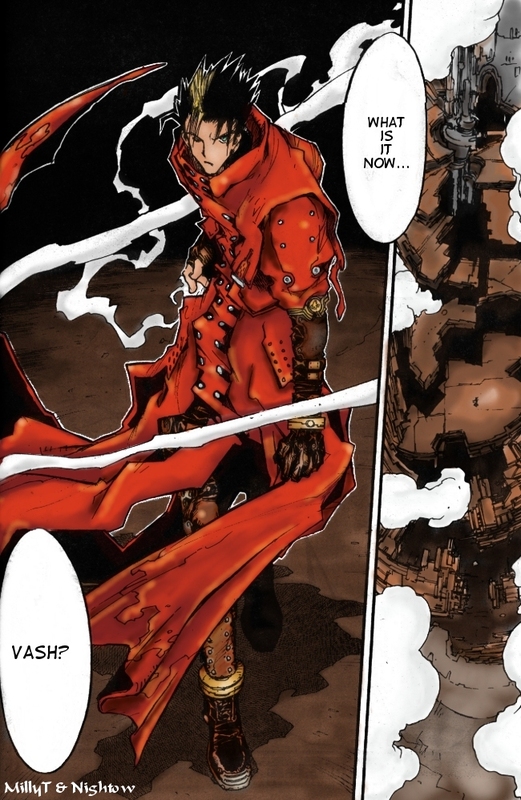 Vash has just got his new arm ripped off and his new coat shot up. 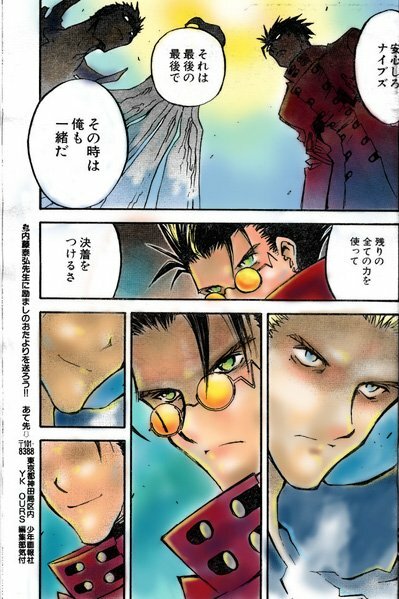 The captions say "What... Vash the Stampede" and Vash is saying "Wolfwood, you look kind of pale." 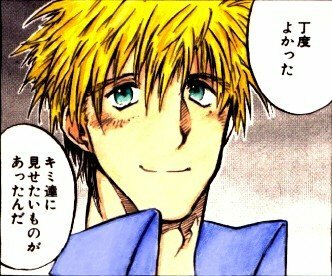 (Mind you I'm not using the Dark Horse translation but one I did months before the book was translated). I watercolored it, for some reason watercolor looks so much better on a scan, don't you agree? 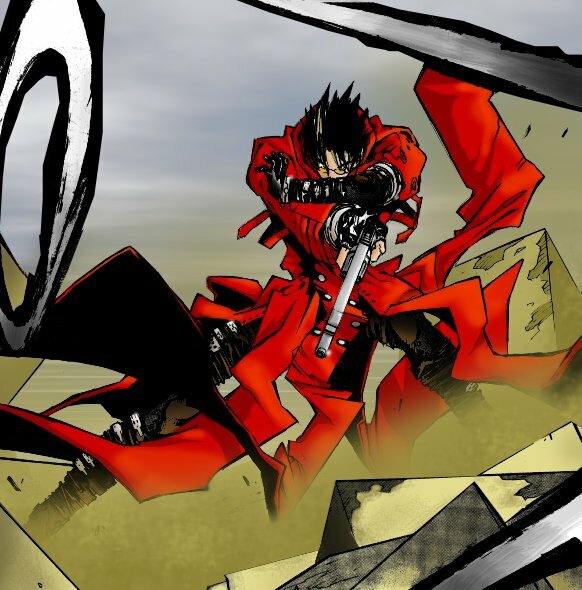 Trigun Maximum #1. This one is a parody I did just because I love Meryl and Milly. Milly always seems to follow Meryl around even if they don't know where they're going! I translated the Japanese for you too. This one is in colored pencil. FYI - I have a habit of making Milly's hair bright blond because Nightow has colored her that way, rather than her more dark blond that the anime colors her as. The only time I colored her that way is on my art page in one painting, but she just doesn't quite look right without the blond hair! 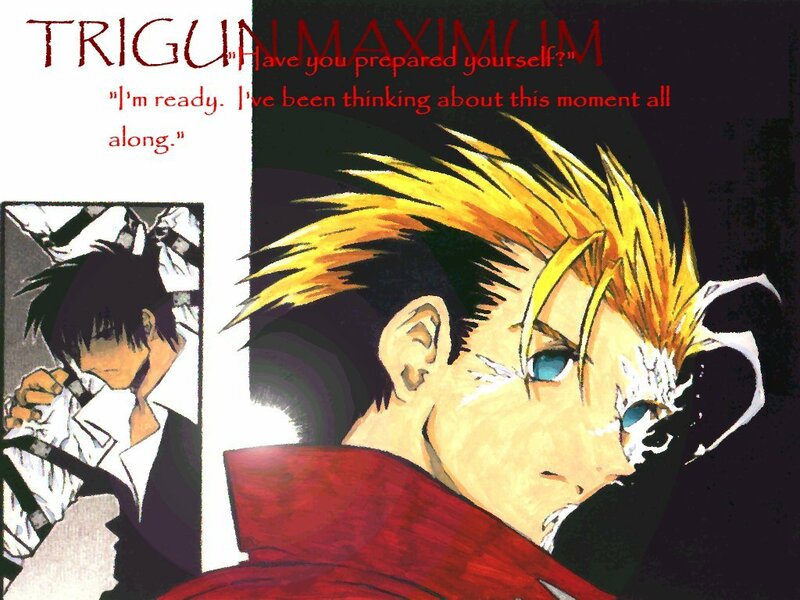 Trigun Maximum #5. This one is for you Susan!! I took out the chapter title and watercolored it. I wanted to try something a little artsy so I only colored his hair, coat and feathers. 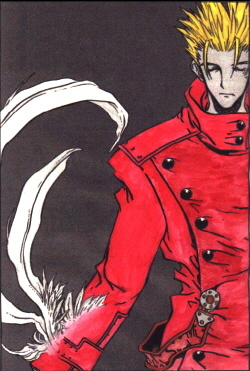 What's odd about this one is that it's in Maximum, but Vash's coat and hair are from Trigun! 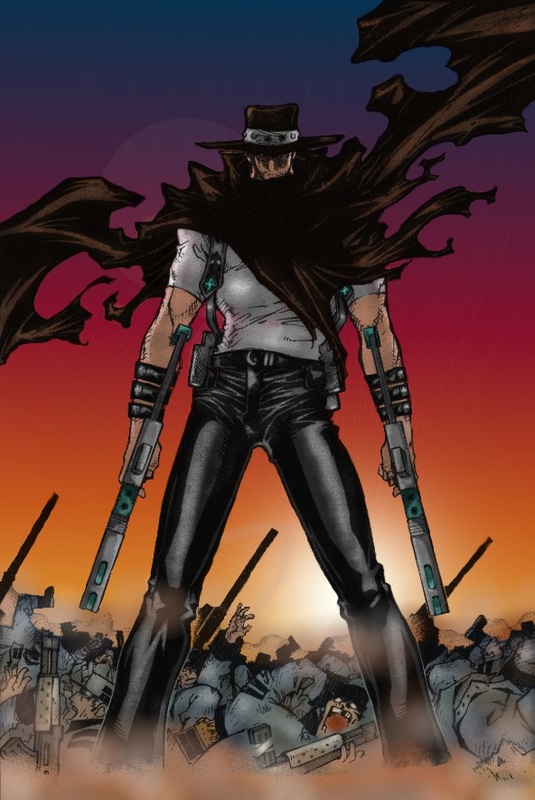 (FYI - there's a flashback in the chapter of Vash first using the angel arm - I imagine this is his very first coat.) 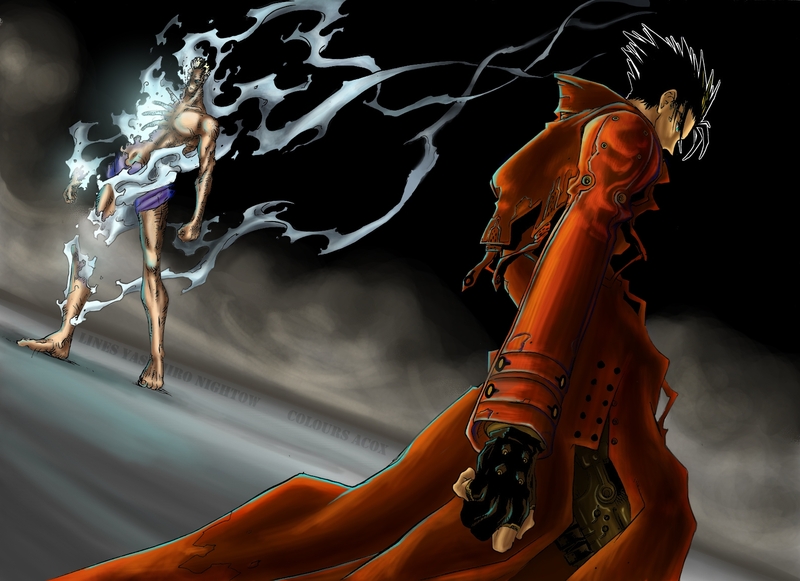 I just LOVE Vash's Angel Arm... There's something really mysterious about it. Well, that's all of 'em folks!! !